So. I've returned home from a lovely conference in Brno. It's Czech Republic's second largest city and capital of Moravia. Wonderful wine district, too. 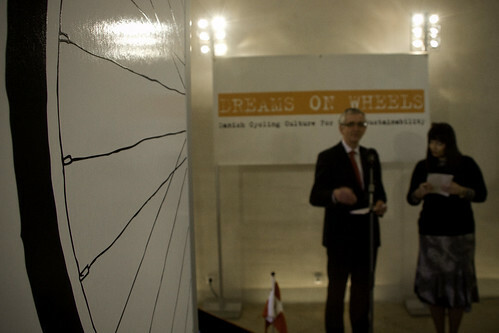 The Danish embassy invited me to speak at a conference put on in connection with the Dreams on Wheels exhibition that opened on the same day. There's lots of great stuff about speaking at conferences like this around the world. One of them is that you get to ride all sorts of bicycles. In the photo, above, we nicked the Danish ambassador's Christiania bike and went for a ride. I'll get to the identity of the passenger in a moment. You also get to stand in rows for photos, which gives it all a fancy feel. From left; Director of the Foundation Partnership Mr Miroslav Kundrata, our Secret Guest, The Danish Ambassador to Czech Republic, Ole Moseby, the Danish bicyle ambassador (small 'a'), Deputy Mayor of Brno (Traffic) Mr Martin Ander and Deputy Mayor of Brno (Culture) Mr Daniel Rychnovsky. 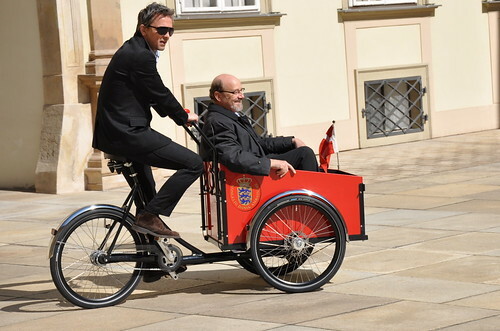 The Ambassador, after buying the Christiania bike, actually uses it to get around Prague when on official business. He's even ridden it up the hill for a meeting with the President of the whole damn country, dismounting in dapper style whilst all the other ambassadors got out of Audis and BMWs. Brilliant. You also get to drink local sparkling wine at openings of Dreams on Wheels exhibitions while the Ambassador speaks. So this is the man in the cargo bike. Or The Man. 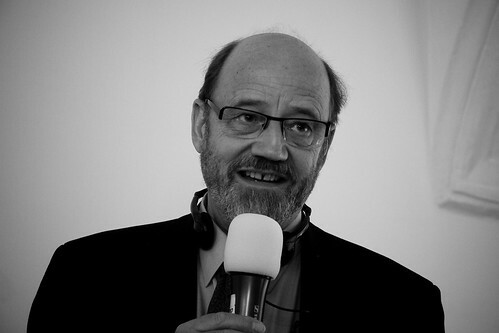 Lars Gemzøe from Gehl Architects. He an I were both invited to speak at Brno City Hall. Me with my Four Goals for Promoting Urban Cycling lecture and Lars with his Soft Cities lecture. Brilliant stuff. 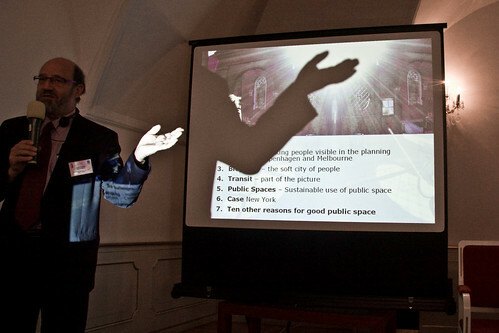 Lars has been an associate of Jan Gehl since the late sixties and he co-authored, among other publications the legendary book Life Between Buildings with Gehl. We had a smashing time. He is only marginally less legendary than the legendary Jan Gehl. What a goldmine of experience and information. Sometimes you get to see interesting signage. There is a lot of political will, it would seem, in Brno to make the city a more bicycle-friendly place. But there is work to be done. 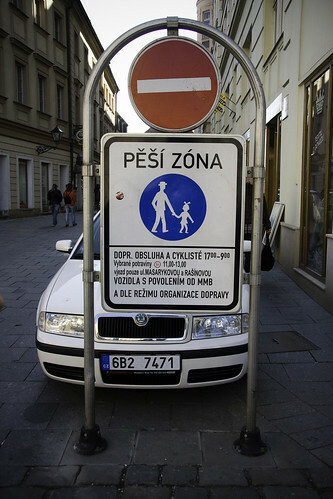 This sign is for a pedestrian zone (apparently that car driver is excepted) and bicycles are only allowed between 17-09. Evenings and the middle of the night. Nothing wrong with pedestrian zones, but don't let cars park there and how about signage letting the cyclists know about alternative routes. You also get to see funny stuff. We were a group of about 20-30 people on bicycles riding to the City Hall for the opening of the exhibition and the conference. This copper had pulled over this girl. He saw the first bike roll past and looked up to shout at them - there wasn't any bicycle riding allowed on this street, either. 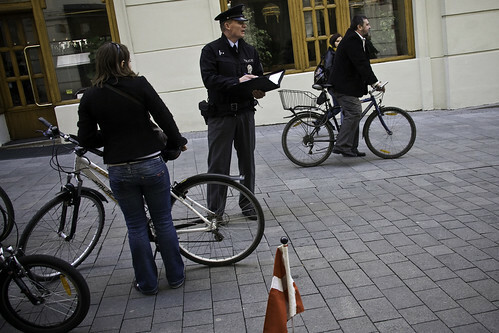 Then a dozen more bicycles rolled past, including the deputy mayor and the Danish ambassador. His face was priceless. I stopped up and asked why the girl was stopped. She said that she was walking her bike and the cop stopped because he thought the bike didn't look like her bike. He thought it looked too big for her and was basically accusing her of stealing it. It was her mother's bike - she lives in Vienna and was borrowing while at home in Brno. She didn't get a ticket but he took her name and address in case someone reported the bike stolen. What a waste of law enforcement time and money. But hey. A great trip and thanks to everyone who made it happen.